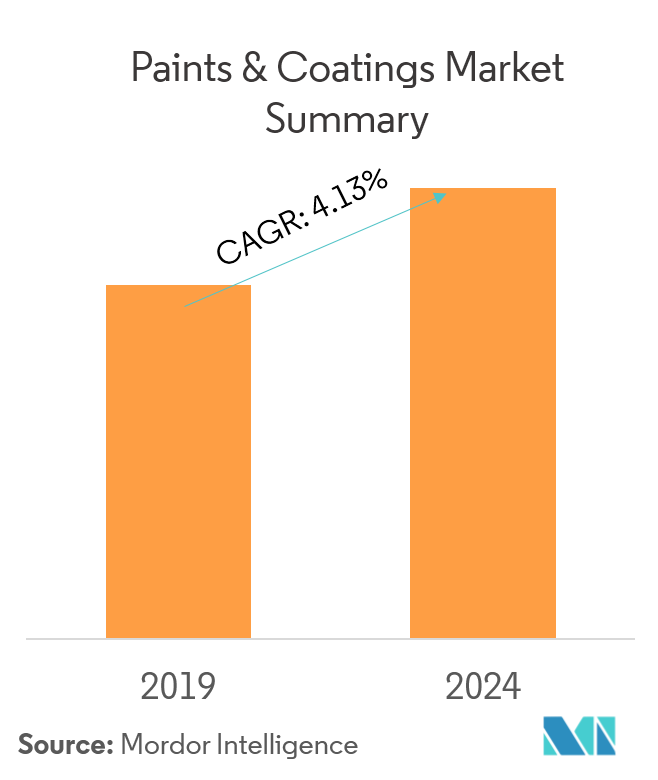 The market for Paints & Coatings is anticipated to register a CAGR of 4.13% during the forecast period 2019-2024. The major factors driving the market studied are the continuously growing housing construction activities in emerging economies of Asia-Pacific, and a rise in the automotive production in Asia-Pacific and Europe. The emerging economies, such as China, India, Indonesia, Vietnam, and Philippines, in the Asia-Pacific region have been witnessing a robust growth in construction activities. Robust economic performance in 2017 is expected to further accelerate the growth in housing construction activities in the region, thereby augmenting the growth of the market. With the increasing usage of paints & coatings, the concerns related to VOC emissions has also been increasing in China. In the country, coating, printing ink, and adhesives production enterprises are encouraged to apply for environmental labels and addressed to discontinue production & sale of paints & coatings with high content of VOCs. This is likely to hinder the market’s growth. The activities in the construction sector in Germany is also expected to grow at a high rate, driven by higher demand for residential accommodation. The civil engineering drive by the country’s government is also likely to have a positive impact on the construction growth, which in turn is projected to act as an opportunity for the market in future. Paints and coatings are extensively used in the architectural sector for both exterior and interior applications. Paints and coatings are applied on exterior of the house to not only to give them a new look but also to protect it from blistering summers, freezing winters, soaking rain, and the daily bombardment of UV radiation without fading, peeling away, and cracking. Elastomeric coatings that retain their flexibility and strand etch ability over a wide range of temperatures are becoming popular solutions for homes, worldwide. In China, government spending has been increasing in order to construct affordable housing facilities to cater to the housing demand. In addition, public-private partnership (PPP) projects have also been increasing in the domestic construction sector. With the help of increase in the private funding, about 2,021 PPP projects entered the implementation phase in the first half of 2017. In India, the infrastructure sector has become one of the major focus area for the government. In the government’s budget 2017-18, the construction sector was allotted USD 61.92 billion. The government aims to boost the construction of buildings in the country, for which it has decided to come up with a single window clearance facility, in order to provide speedy approval for the construction projects. All the aforementioned factors, is expected to drive the global market during the forecast period. China is globally recognized for its architectural boom. The demand for low-cost housing and commercial housing is the reason for its growth in the recent years. China’s real estate sector has been growing rapidly with increased investment by the government. In 2016, property prices in China rose by about 30.0% due to increased activity in the real estate space. 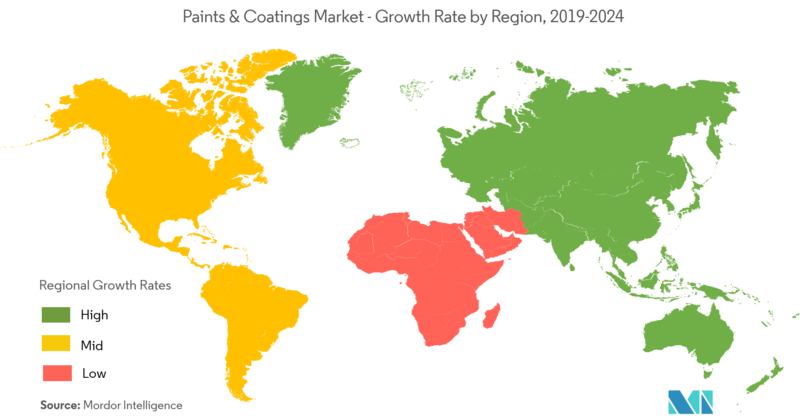 The growth in construction is expected to positively affect the paints & coatings market in the country. India’s construction sector has been growing rapidly with increased investment by the government. The Indian government's ‘Housing for All by 2022’ is also a major game changer for the industry. The growth of commercial real estate has been driven largely by service sectors, especially IT-ITeS. The production of Trucks in India recorded a growth rate of 9.9% year-on-year reaching a total of 2, 93,657 in 2016. The production of Light vehicles in India recorded a growth of 7.89% y-o-y reaching a total of 4,143,202 in 2016, which in turn, boosting the demand for automotive coatings. The Indian automotive industry recorded a growth rate of 7.9% y-o-y reaching a total of 4,488,965 in 2016. Japan's housing sector is expected to witness moderate growth, owing to the increased investments over the past few years. Japan was projected to spend USD 61 billion on infrastructure in 2017. Increase in household spending has increased the demand for remodeling of houses. The 2020 Olympics is expected to boost the new commercial construction in the country, thus, driving the market. 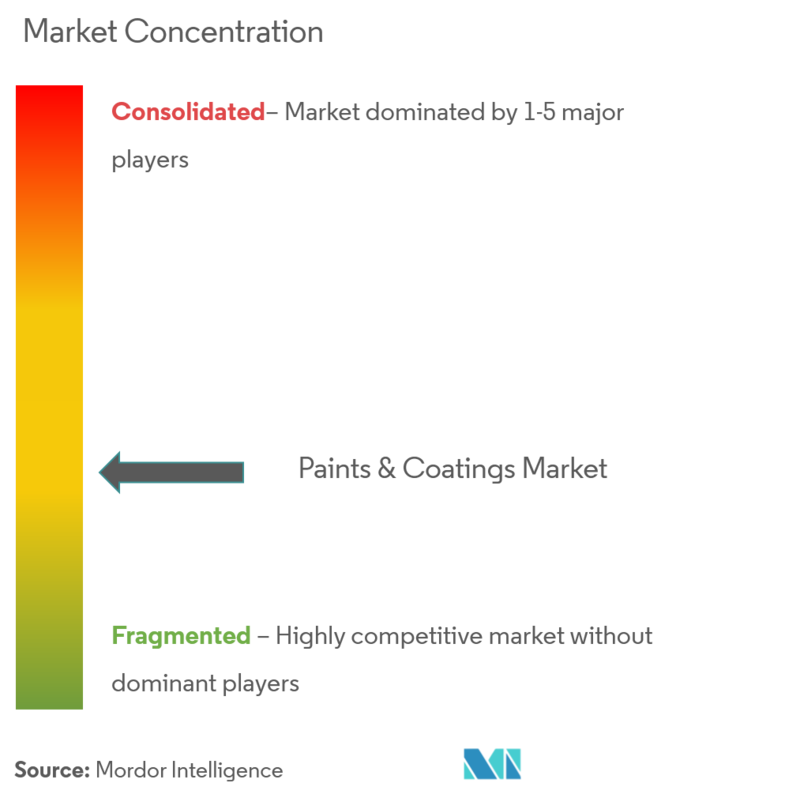 The paints & coatings market is partially fragmented. In terms of market share, few of the major players currently dominate the market. 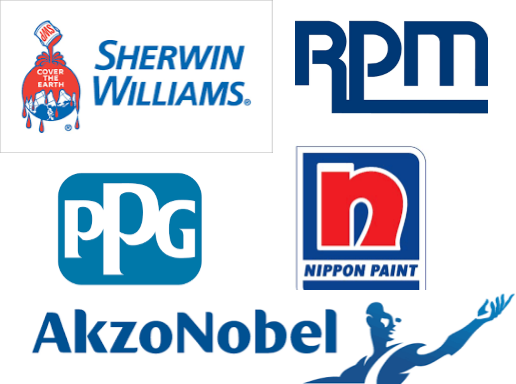 Key players in the paints & coatings market include Akzo Nobel NV, RPM International Inc., BASF SE, Asian Paints, Teknos Group, The Sherwin-Williams Company, Berger Paints India Ltd, Beckers Group, PPG Industries Inc. among others.